A grand welcome to all of you to our stunning collection of 33 captivating bathroom chandelier ideas! A bathroom is more than a space to wash and clean yourself. It is that private spot in your home where you can escape and spend some quiet time alone. There are numerous fixtures and features to make your bathrooms luxurious spots. One among these features is the chandelier. A chandelier can enhance the style quotient of your bathroom, and in many cases, helps you bring in the aura of a spa. Go through these eye grabbing chandeliers for bathroom and make a pick that suits you best! The ball chandelier shown above adds a sparkling touch to this contemporary styled bathroom. The chandelier hangs just above the freestanding bathtub in white, and has little bulbs inside the balls. It matches well with the rug and the rest of the decor. Chandeliers come in a variety of shapes and sizes. Large chandeliers are used in such bathrooms where the space is huge, while small ones adorn those that are usually limited in space. 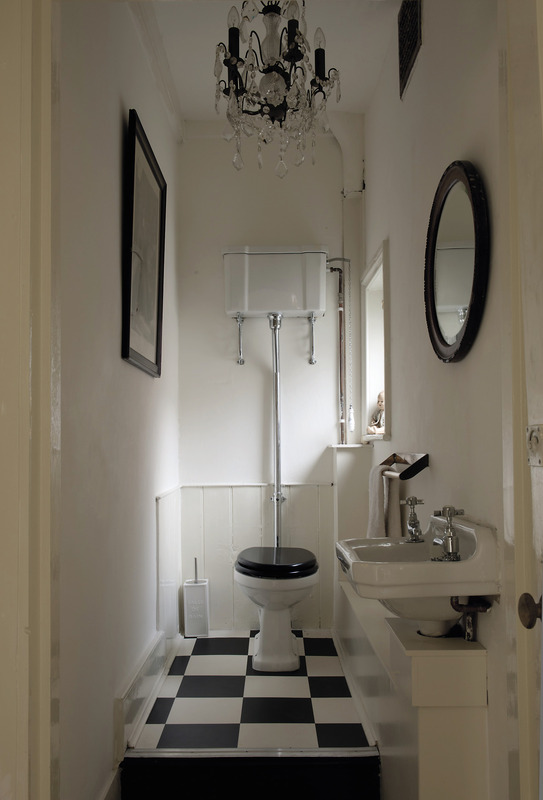 But, sometimes, small chandeliers deck up large sized bathrooms as well, just like in the image above. The small chandelier seen here is made of crystals and looks attractive against a white color palette. It hangs just above the entrance to the bathing area. This bathroom has been styled on American Traditional lines with a soft color scheme. The most eye catching feature here is the small traditional chandelier that hangs right above the white bathtub. The chandelier is built in golden accents and measures 24 inches in diameter. It’s sparkling crystals stand out among the dark framed mirrors installed in the bathroom. 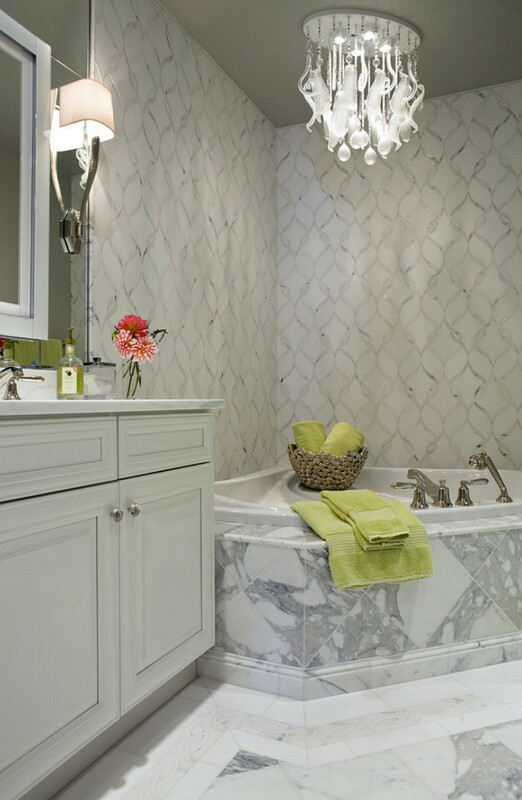 Adding a bit of luxury is a must if you want to create a spa like ambiance in your bathroom. This is what you feel when you step inside this bathroom. It looks dazzling with a big oval chandelier that is draped with bling and adds razzmatazz to this white schemed bath area. The chandelier’s beauty seems to contrast well with the red floral arrangement over the vanity. Bathroom chandelier ideas, like we said, come in different sizes and shapes. The one seen above is a sphere shaped chandelier that hangs just over a freestanding oval shaped bath tub. The sphere chandelier looks very gorgeous against the white color backdrop and the draped windows. It is a three candle chandelier made of metal. Bathroom chandelier ideas like the one shown above suit French styled bath areas. The chandelier here is French styled with candles. It hangs above the bathtub that is lodged bang in the middle of the bathroom. The design of the chandelier is traditional and blends in nicely with the other decor features like the wall sconces and white toned marble counterparts. This bathroom has been styled in a grey and dark color palette, the look of which is enhanced artistically by the white drum shaped chandelier. This chandelier is a stylish piece of lighting used in the bathroom, but, is not overtly ornamental. It’s simple drum shape adds a dazzling touch to the whole decor and makes it look lively. This bathroom is Victorian in style and has predominantly wooden accents all over. The wooden cabinetry and the bathtub frame are the two most eye catching features of this bath area. But, there is another element that speaks volumes of the attractiveness of this room. Yes, it is the chandelier draped with crystals and candle lights. 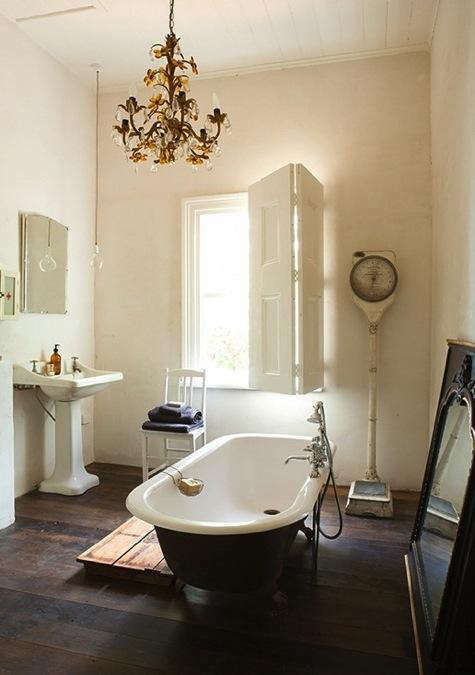 It is Victorian in built and imposes itself gorgeously over the white and wooden bathtub. A classic example of rustic bathroom can be seen in the image above. It speaks rustic from all quarters and nooks. 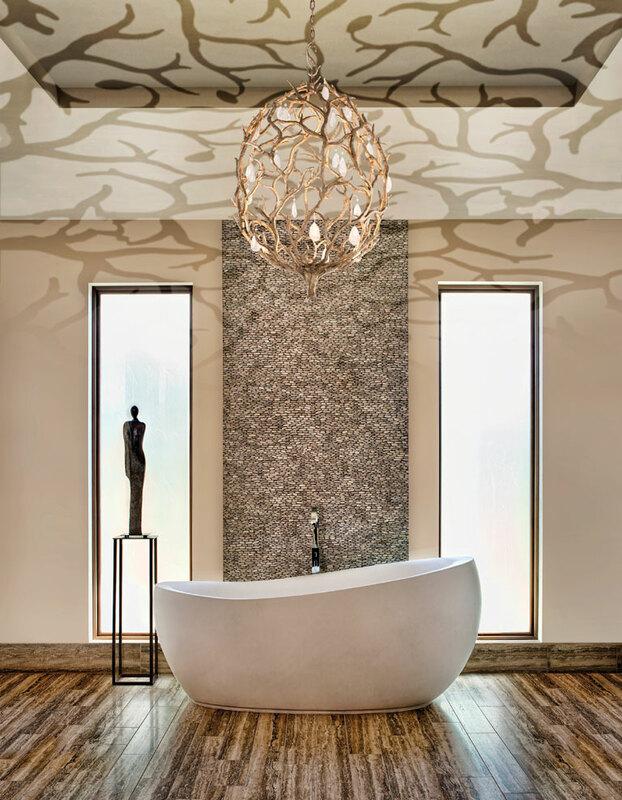 The most striking feature of course is the antler chandelier. This chandelier is a statement piece of art that blends nicely with the stone walls and the bathtub designed in vintage style. The antler chandelier can be built of animal horns or branches. Chandeliers like the one hung from the roof in the image above look extremely sassy, and go well with rustic theme. The chandelier is made of iron and has a body with curves. It is a four candle chandelier and adds to the warmth of the room along with the iron sconces hung next to the vanity mirror. One of the most appealing features to be seen in this dramatic bathroom is the crystal chandelier that is hanging over the wooden accented and white tub with a fireplace. It is a candle lit chandelier that adds a lot of drama to the warm hues of orange and red tones splashed all over on the walls, the draperies and the roof. Apart from the main hanging chandelier, there are two wall mounted chandeliers of the same design. This crystal droplet chandelier design seems to enhance the bathroom’s attractiveness lent by other chic accessories like mosaic ceiling, textured marble mosaic back-splash, vanity frame-less mirrors and sconces. The chandelier is draped with droplets made of crystals and lends an illuminating touch to the nooks of this bathroom. A cascading chandelier design lends an elaborate look to any space. It seems to float easily in the air and makes rooms appear gorgeous. 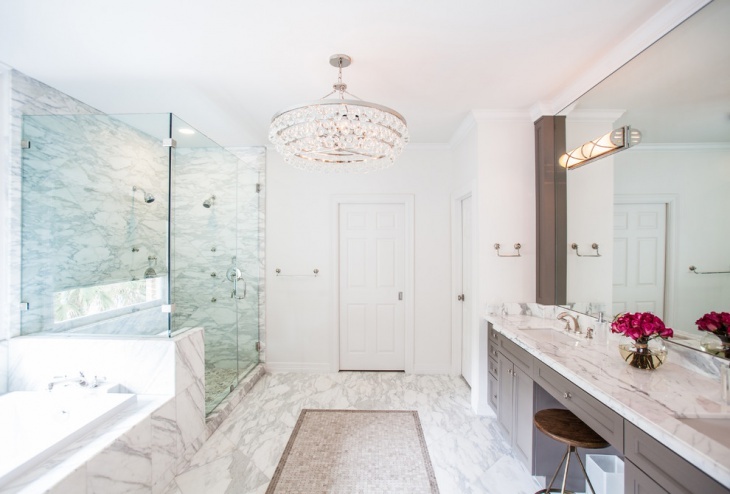 The bathroom above is pretty huge and is dressed up with a white compact bathtub, frame-less shower area, stylish furniture and an eye grabbing cascading chandelier in crystals. It acts as the highlight of this bathroom and suits contemporary styled decor. Two elements seem to be working meticulously inside this bathroom; metal and wood. The metal chandelier above hangs elegantly over from the roof and is made of metallic balls. The cascading design looks very appealing. It blends nicely with the wooden back-splash and the flooring. The small bathroom chandelier seen in the image above is made out of metal. It looks very chic and is round in shape. It is placed over the freestanding white bathtub and has a long metallic suspender. 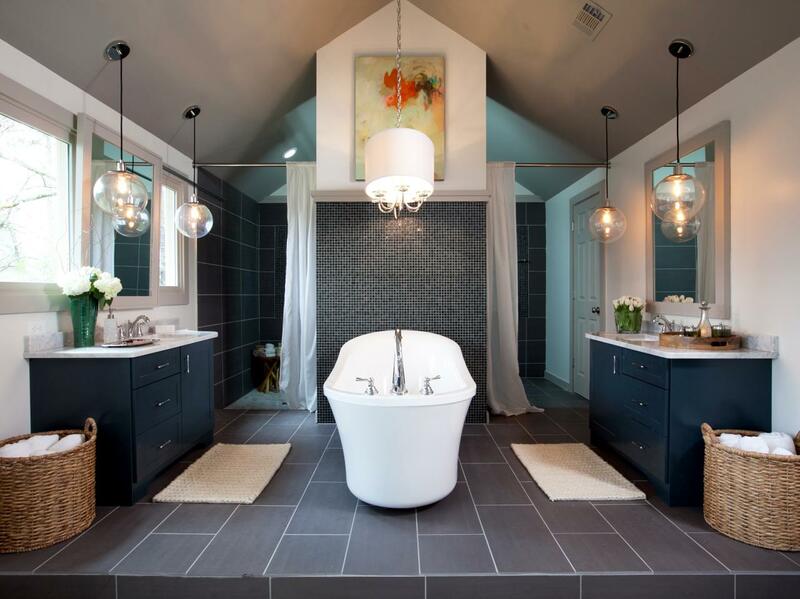 The chandelier seems to pair perfectly with the modern tones of this amazing bathroom. 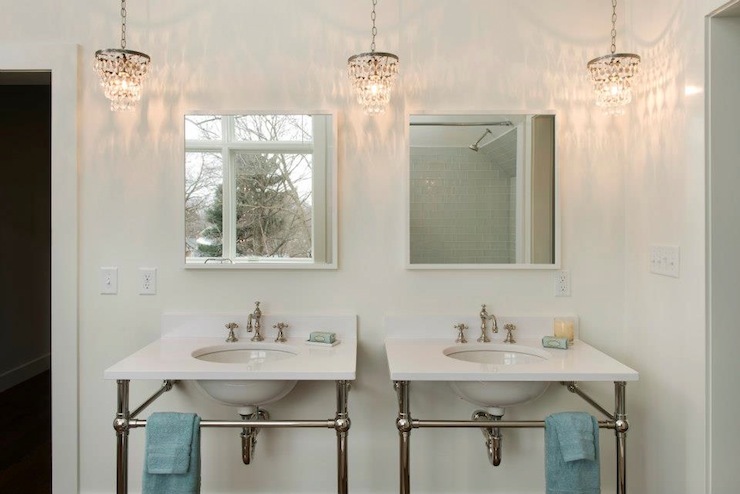 The three small crystal drop chandeliers seen above light up the two vanity mirrors and the the two white sinks. These are used as focus lighting, and its only because of these chandeliers that the whole bathroom looks airy and very well lit. The chandeliers have metal bodies and chains. They look stunning against the white painted walls. Brass and crystals form a stunning pair, such as one seen in the image above. 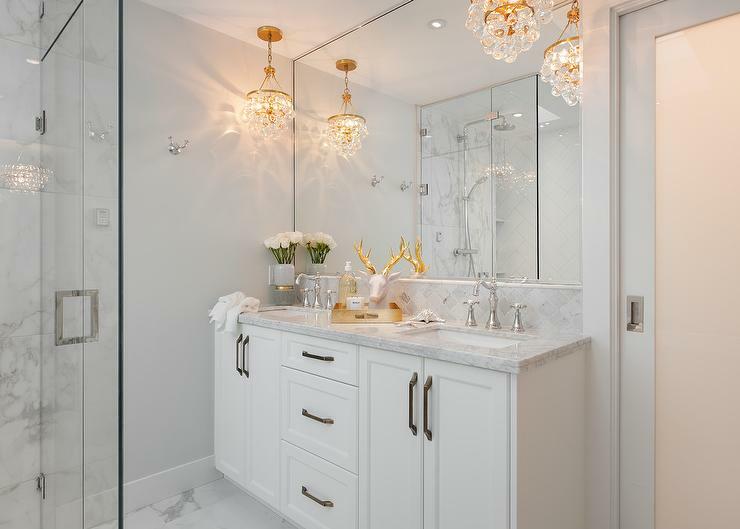 The bathroom is painted in white color scheme and seems to come alive with these adorable chandeliers in brass and crystal. Two of these are placed strategically at both ends of the vanity area. These match perfectly with the brass toned deer antler showpiece arranged over the counter top. There is a feeling of awe when you come inside this bathroom. And that feeling is lent by a stunning over sized drum chandelier made of crystals and shade. It seems to hog all the limelight and weaves magic along with the wooden vanity, white wooden frames, bathtub, a cushy seater, stone walls and flooring. The orb chandelier above looks every bit stunning and sassy. It is made of twine and hangs elegantly over the bathtub. The chandelier’s design makes it a perfect addition to any modern styled bathroom. Moreover, the white scheme used all over seems to get a punch with this orb chandelier in brown. The chandelier with candlestick decor adds a stylish punch to the small bathroom seen above. It hangs just above the bathtub in white and merges nicely with the white framed vanity mirror, white towels, and the white sink cabinetry. A simple designed chandelier such as this one is enough to illuminate a small spaced room. Antique chandeliers come in different styles. Some are more ornate than others, while a few are simply mind-blowing and out of this world. In the image above, the antique chandelier is eye grabbing but is not overtly elaborate or ornamental. It has a classic mix and match of black and white. The black candlesticks are chunky while the crystals dropping from the chandelier are sparkly. The checkered flooring matches nicely with the chandelier. What a bathroom it is! It is not only huger than huge, but is also dressed up with the most striking features and accessories. The most elegant and striking feature installed in this bathroom is the ornamental cube chandelier in crystal with a nickel polished frame. The lamp shades are made of natural paper by a company called Visual Comfort. The crystal chandelier above hangs low over the white tub and has candle sticks for illuminating the room. It gels nicely with the drapery dressing up the window, and the maroon painted walls. One can spot crystal beaded strings that make the chandelier look ornate and elegant. This is a period era bathroom dressed up as warmly as possible. The chandelier above takes the chunk of limelight as it is ornately designed in floral tones and candlesticks. The floral carvings and the metallic body of this chandelier make it stand out among the rest of the decor complimented by light colored walls, and wooden accents. Minimal is the flavor of this bathroom as it is decorated as simply and elegantly as possible. The focal point of this room is the wooden branch chandelier that looks like an orb. It is rustic but matches well with the brown and cream color palettes splashed in the bathroom. The sparkling orb is one among the other stunning bathroom chandelier ideas showcased today. The bathroom in the picture is modern themed with accessories that blend in seamlessly. For example, the ceiling and floor are made of wood, and match well with the marble walls. To lend a stunning touch, the decorator has hung an orb chandelier with many shimming bulbs. It definitely makes the bathroom lively and energetic. The coastal themed bathroom in the image here looks attractive with many state of the art accessories and features. But, the one aspect that makes it look inviting and out of the world is its lighting that is done by its three chandeliers and the ceiling lights. The glass chandeliers are hung above the bathtub and help in illuminating the area well. These look gorgeous and blend easily with the white elements used in the bathroom. The sparkling bathroom above looks stunning and is designed on contemporary lines. Cheri Wentworth has designed it and dressed it up with the choicest of accessories and lighting. The large black mirror looks dazzling together with a red chandelier that seems to steal the limelight here. It is installed to match the lovely red bowl placed on the vanity area. 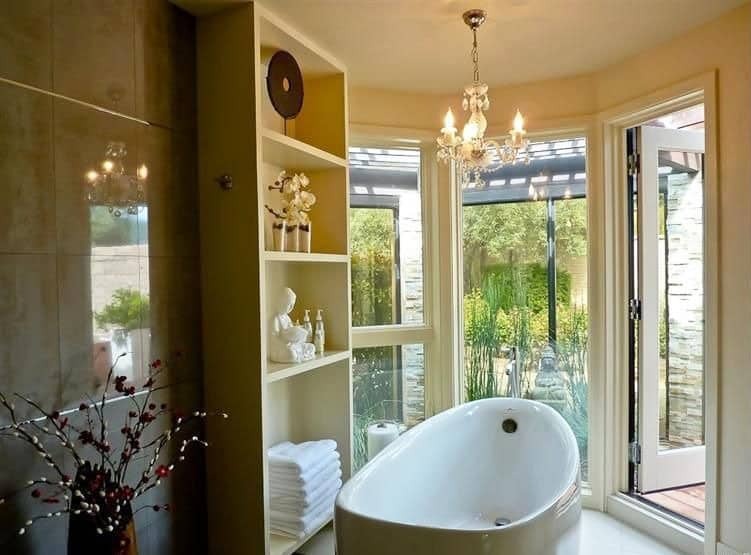 Drum chandeliers for bathroom are in vogue always. These look stylish and very chic. Also, these pair up with any theme or accessory easily than others. Seen above is an attractive black drum chandelier with crystal droplets. It is the only piece in black, and stands in stark contrast with the white decor of the bathing room. The contemporary chandelier hangs over the large sized oval bathtub. It is made of metal and has lamps appearing out from it. The modern built chandelier is an art by itself and makes the whole decor complete. It is used for ambient lighting of the room. The bathroom above is designed on Art Deco lines and features an ornamental chandelier with large glassy balls. These balls are designed in such a way that they face the roof in an upward pattern. The chandelier is hung at the middle of the roof and offers lot of light to the whole bathing area. The small chandelier installed over the freestanding tub looks elegant in this Asian themed bathing area. It offers additional lighting to the whole place which otherwise is lit brilliantly by natural sunlight. The chandelier looks compact with thick candlestick bulbs. 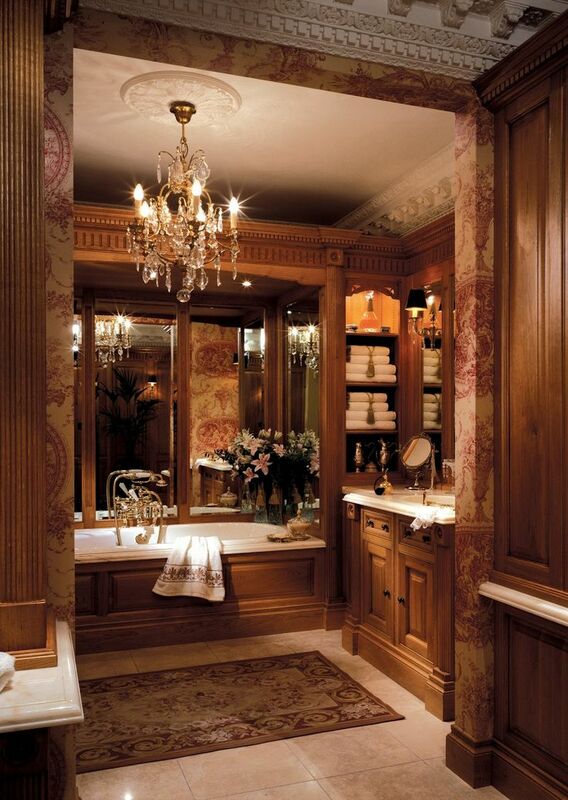 This is a small bathroom with chandelier design that will take you by surprise. Yes, the chandelier is designed with glass lantern shades and candlesticks inside. It is a piece of art in this bathing room that is dressed with a pastel color scheme. It matches and blends nicely with the two wall sconces that make the vanity area well lit up. A chandelier is much more than just a light fixture. It is a tool to enhance your bathroom’s appearance just like any other accessory. The bathroom chandelier ideas such as the ones shown today will definitely help you give a whole new twist to your bathing areas. So hurry…pick one that you really like!